US elite military academy annual pillow fight ends in broken bones and concussions. An annual pillow fight for freshmen at the U.S. Military Academy turned into a bloody brawl that left 24 cadets with concussions and six others injured, according to reports. 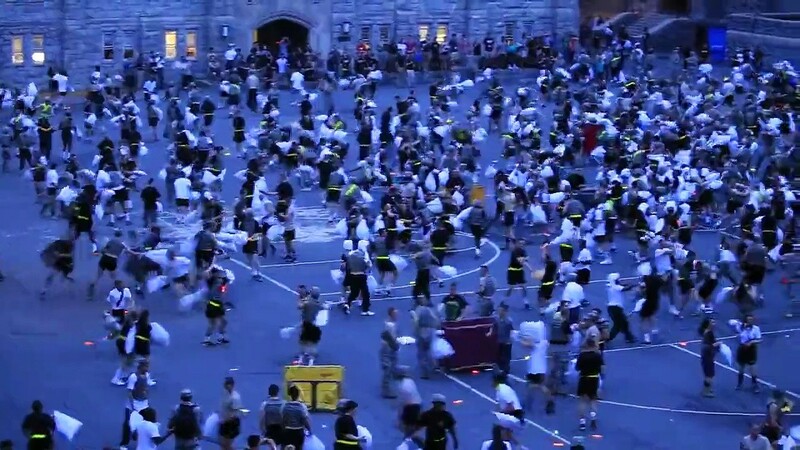 Staff at America's elite West Point military academy have launched an investigation after cadets involved in a ritual mass pillow fight hospitalised each other by hiding helmets into their pillow cases. Held every August to mark the finish of a summer of tough training, the night-time pillow fights are designed as a fun way to instil a sense of team spirit in the young cadets, who are groomed to become the cream of America's military leadership. But in this year's brawl - held on August 20 - a number of cadets appear to have cheated by packing their pillow cases with hard objects such as helmets. That led to at least one cadet being knocked senseless, while others suffered injuries including including split slips, dislocated shoulders, and a broken leg.